An underrated atmospheric sci-fi film that combines competent acting with tight direction but with mediocre special effects. Your Weekly View into The Unknown…. 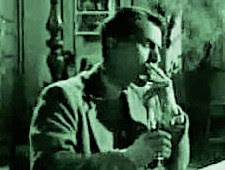 The disappearance of Professor Quatermass – Dead or In Custody? What happened to the United States Air Force’s 7,600-pound (3,400 kg) Mark 15 nuclear bomb? Was it simply “lost” in the waters off Tybee Island near Savannah, Georgia in the United States? What is Project A119 and has the US Air Force detonated a nuclear bomb on the moon? If so, then why? A remote Swiss mountain resort under threat! Mysterious extra-terrestrial inhabitants of a radioactive cloud! Some of our readers will no doubt be familiar with an incident that received press coverage concerning a series of unexplained deaths that occurred three years ago in the Andes mountains. The deaths in the Andes were reported to have been associated with an unexplained radioactive mist and an odd cloud formation believed by locals to be inhabited. Of course, at the time this explanation for the deaths was roundly ridiculed and dismissed, while more rational-sounding explanations were sought after to make sense of what happened. This special report concerns my own recent personal experiences on the Swiss mountain Trollenberg, where a series of deaths occurred which I and others firmly believe are related to similar incidents that occurred three years earlier in the Andes mountains. The picturesque Swiss Alps forms the backdrop to the events described below. Picture in your mind a small village nestled between steep majestic snow-capped mountain peaks. Your view then shifts to the rugged face of Trollenberg Mountain where can be seen a single small cloud clinging to the side of the mountain. You then zoom in to see a couple of student climbers clinging ant-like to a mountain ledge overlooking the valley below. 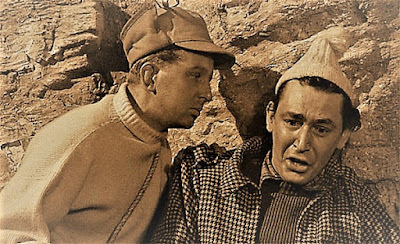 They are listening to a third fellow climber above them complaining about a sudden onset of bitter cold and a fog that has cut visibility. You listen as the third climber calls out to his comrades that someone is approaching but that he can't discern who it be might due to the fog. Suddenly, your heart leaps violently as he screams and plummets past his comrades on the ledge below. Quickly, his two fellow climbers secure their friend’s rope and begin to haul him back up. The horrific sight of his blood-stained lifeless body strikes one of the would-be rescuers speechless and renders him powerless to move. 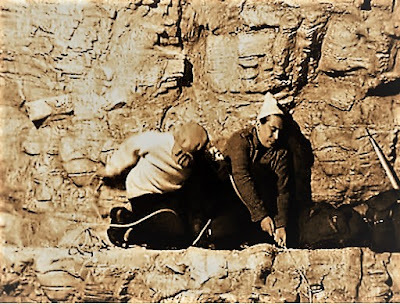 His fellow climber next to him strains against the weight of the rope which gradually becomes worn against the jagged rock face. With the snapping of the rope, the body falls down the face of the cliff into a seeming abyss of eternity. In reply to his friend’s admonishment, the climber who had been paralysed with horror can only exclaim with horror, "Didn't you see? His head... it was torn off!" 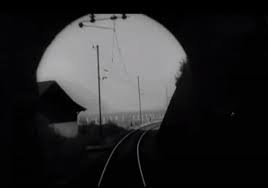 In the valley below, a speeding train is swallowed whole by the blackness of a tunnel only to eventually emerge into daylight at the tunnel’s far end – a symbolic indicator of the "train" of events that will be the subject of this article. On board the train are two beautiful young women, Sarah and Anne Pilgrim who form a London mind-reading act and are both on their way to Geneva. Seated opposite them reading his newspaper is a rugged-faced American by the name of Alan Brooks, a UN trouble-shooter. According to Mr Brooks, Anne was awoken from her nap by Sarah who pointed out to her sister the mountain-view outside the train cabin window. As she looked out toward Mount Trollenberg, Anne seemed to fall into a kind of reverie or trance. 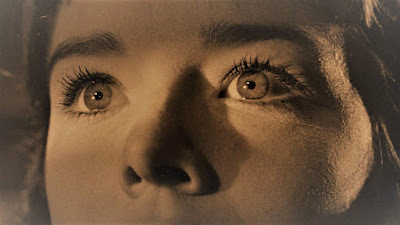 Whatever she saw or thought she saw affected her greatly before she unexpectedly collapsed into the arms of Alan Brooks. Mr Brooks went on to report that after the train's conductor announced the next stop as being Trollenberg, Anne declared out of the blue that they must get off at that stop. Even more surprisingly, Anne seemed to possess detailed knowledge of the town even though she had never been there before. How to explain Anne’s knowledge of the town? Why did she feel compelled to stop at Trollenberg? In the station lobby, Herr Klein, the proprietor of the Hotel Europa and the Mayor of Trollenberg, introduced himself to Alan Brooks and the Pilgrim Sisters. He was able to accommodate them without a reservation at the Europa which surprisingly was not fully booked during the peak season! Here was someone who obviously knew more than he was willing to let on. Both Mr Brooks and Sarah Pilgrim recalled that on the drive from the train station to the hotel Anne started to behave in a peculiar manner: First, by describing the recent death of the climber on Mt. Trollenberg, together with other details she couldn’t possibly have known about. Second, her explanation of how local mountain folk believe that the mountain is cursed. It was soon revealed that the recent tragic death of the young climber was not the first death to have occurred on the mountain. In fact, it appears that anyone who chose to venture there would end up disappearing without a trace. 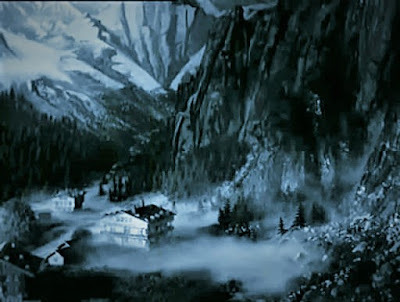 This part of our dark tale ends with the cursed brooding presence of the mountain looming over a picturesque landscape containing garden, chalet and mist-shrouded Alps. Why then would such a scene seemingly applied from the palette of a god be so unsettling to young Anne Pilgrim? It was while I was enjoying a glass of wine and smoking a cigarette at the bar of the hotel that I first became acquainted with Mr Brooks and the Pilgrim Sisters. Upon seeing Anne and Sarah, I had the distinct feeling that I had seen them somewhere before. But where? 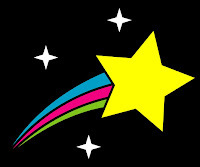 The rest of this report will contain descriptions of events which I personally witnessed and events which were related to me by the other participants in this strange affair. My thanks go to those who agreed to participate in the staged photographic reconstruction of events shown here in this special report despite some of the bad memories it must have given rise to for some of them. Sarah Pilgrim later informed me that after she and her sister retired to their room, Anne began to act strangely when she gazed upon the scene outside their window. It was as if she were transfixed by a vision of something beyond the here and now but one of which she was somehow a part of. Sarah could not understand how her sister could be able to describe details about things of which she had no prior knowledge such as a hiking shack and the cable car. 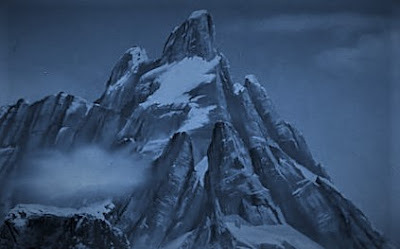 Anne could not fathom why the mountain seemed to be so familiar to her, why she was so attracted to it and the nature or source of the dread and terror surrounding it that she was feeling. Had she simply read about it in a travel brochure, or as Anne herself was starting to suspect, had she recalled it from a dream? From the start, Anne struck me has having a somewhat ethereal quality about her, as if she were not really a part of the hum-drum matter-of-fact grind of day-to-day life. There was some quality, some vulnerability or even some special insight which set her apart from most people. Every society has such people – those who are forced to tread a lonely path through time and space possessing unwanted knowledge, displaying unusual abilities and observing all that transpires around them. Their fate is that they are either revered or they are crucified. Being a reporter and a rather nosey / curious sort of chap, I decided to pay Mr. Brooks a visit in his room. While engaging in some small talk with Brooks as he was unpacking, I tried to fish for information. Either I was not very subtle, or Brooks was naturally a very cagey and cautious fellow. He was not very impressed with my attempts at interrogation and was not very forthcoming with information. Suddenly, I caught sight of a revolver in one of Brooks’ bags. Well, that certainly piqued my interest! 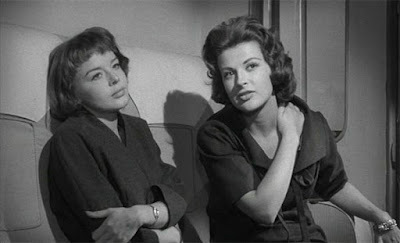 At that moment it suddenly occurred to me where I had seen Sarah and Anne before. I recalled that they were performers with a mind-reading act in London. After I left Brooks, I decided to make a phone call to my paper to put in a request to have our mysterious Mr. Brooks checked out. 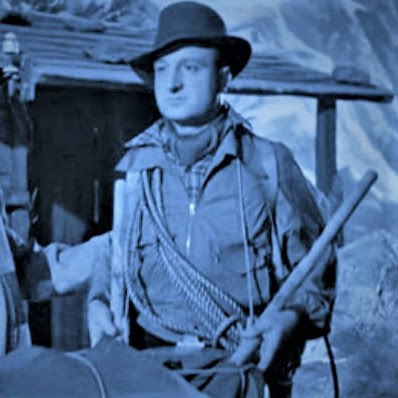 Later on, at a gathering at the bar, geologist Dewhurst and his mountain guide, Brett were making preparations to climb the Trollenberg mountain and discover the reason behind the deaths that had occurred on the mountain. Some the theories that were offered up ranged from a peculiar mineral formation whereby chemical changes in the mountain rocks had loosened or cracked them, making climbing the mountain much more dangerous, through to the villagers’ opinion that something evil must be the cause. In the case of the young climber’s tragic death the previous week, I felt that the rope had become tangled around his neck, thereby decapitating him. One of the fellows at the gathering by the name of Hans, however, pointed out that the rope had been tied around the young climber's waist! A good point I had to admit to myself. The scene now shifts to the cosmic ray observatory whose massive structure is more akin to a fortress or bunker with its huge concrete walls, heavily reinforced steel doors and enormous observatory window steel shutter. In addition, TV monitors provide a wide-ranging exterior view from a console inside. Apart from its scientific function of detecting cosmic rays, it is also meant to be impervious to Nature’s onslaughts in the form of avalanches. A testament to Humanity’s arrogance perhaps? Professor Crevett greeted Brooks at the observatory's entrance and they soon after began to consider the death of the student mountain climber, along with other similar incidents in which no bodies had ever been found. Such mysterious disappearances had occurred all in the same area of The Trollenberg. A radioactive freak of nature? Brooks informed me that at the time that he considered such occurrences as being just the inevitable result of inexperienced climbers underestimating the dangers of the treacherous peak. The professor apparently pointed out that Mt. Trollenberg had a single small cloud on its south face, which should not have been there. Brooks remained unconvinced and told the professor that "where there are mountains, there are always clouds." Brooks went on to say that the professor informed him that this little cloud never moved, and that it was radioactive. To prove his point, the professor used the observatory's cosmic ray detector to scan the mountain. There was no mistaking it: each scan registered high radiation levels as the scanner passed the cloud! Brooks and the professor recalled the similar incident that occurred three years earlier in the Andes. Even though Crevett was in favour of alerting the authorities, Brooks was all too conscious of how the incident in the Andes had damaged his credibility. If there was no evidence to support his claims, his reputation and career would be in jeopardy. 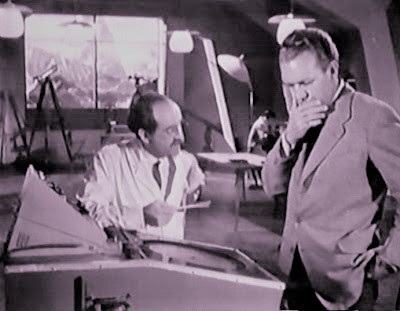 According to Brooks, he declared to the professor, "...I'm not going to stick my neck out again like I did in the Andes…....they practically accused me of dreaming the whole thing up. If I was to take a hand here, I'd have to have a list of documented facts, and they'd have to be pretty conclusive." The two climbers, Dewhurst and Brett had arrived safe and sound at a wooden cabin. After stowing away their gear, Brett used the cabin's telephone to inform the others at the hotel of their safe arrival. Later in the evening as Dewhurst slept, it appears that Brett had opened the cabin door and looked out at a scene in which visibility would have had significantly declined. The reason: a small cloud at that time would have descended the mountain and have brought with it both a thick fog along with an intense chill. Meanwhile, in the lobby of the Hotel Europa, the Pilgrim Sisters gave a mind-reading demonstration at which Anne correctly identified a couple of objects that were hidden from her sight. While describing the scene inside a small snow globe, Anne began to give details of a small cabin in the scene. 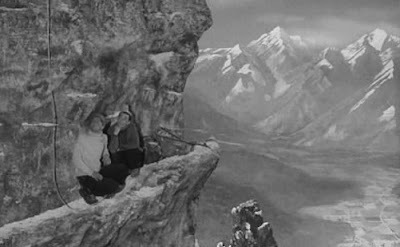 Suddenly, it became apparent that through her trance-like state she was no longer describing the cabin in the snow globe but was instead describing the cabin on the slopes of The Trollenberg where Brett and Dewhurst had camped for the night. She described Brett coming up the slope and Dewhurst asleep in his bunk. The spinechilling account Anne gave was unnerving and Sarah was plainly disconcerted by her sister’s unexpected demeanour. Suddenly Anne collapsed while Brooks made for the phone to call the cabin. Dewhurst answered and assured Brooks that all was OK and that Brett had probably gone outside for a bit of air. Prof. Crevett and I spent some time watching over Anne. Crevett later insisted that Sarah take Anne away from the area first thing in the morning. He was also able to confirm that Anne was indeed truly telepathic. 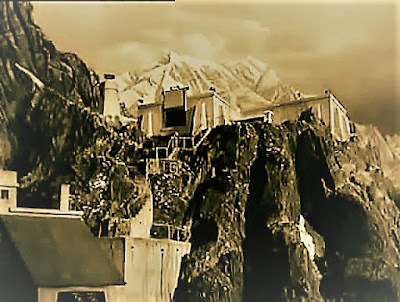 Crevett’s assistant, Wilde contacted the professor to inform him that the strange radioactive cloud had begun to descend the face of The Trollenberg toward the cabin and that its radioactivity was beginning to increase. With the cloud moving into the vicinity of the cabin, Brooks made contact with Dewhurst who confirmed that Brett had not yet returned. He also mentioned that visibility was restricted due to the heavy fog outside and that it had become extremely cold. Apparently, Dewhurst heard something outside the cabin and went to check. As Brooks listened on his end of the line, he was shocked to hear screams of horror before the phone line went dead. Before those present could recover from the shock, the nerve-jangling ring of the lobby phone heralded news from Wilde that the cloud had just then begun to move away from the cabin. Coincidence? Myself, Mayor Klein, Brooks and several villagers assembled before dawn in the hotel lobby in preparation for a rescue expedition. A search plane was organised but it wasn’t expected to arrive until later that morning. 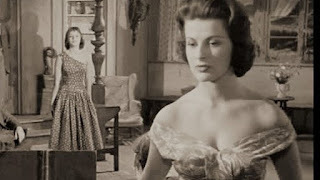 Professor Crevett was able to explain to Sarah that Anne was mentally receptive to the mental images that Sarah transmitted to her during their act, somewhat like a radio receiver. However, her mind in the vicinity of The Trollenberg had been overwhelmed by the mental images projected by a much more powerful mind. The rescue party finally made their way to the cabin. Strangely we found that the door was bolted from the inside. After breaking the door in we entered to find the cabin’s interior frozen with ice crystals festooning the bunk blankets. Even more shockingly, we discovered the body of Dewhurst under the bottom bunk – minus his head! As preparations were made to carry Dewhurst's body back on a litter, I discovered the broken phone lines which crumbled when Brooks touched them having been crystallized by intense cold. Meanwhile, it transpired that two members of the search party had made contact with the search plane via a portable radio. After an exchange of map coordinates they proceeded to search for Brett. According to Sarah, when she returned to the hotel room she found Anne missing along with her coat. Sarah then rushed out to catch Anne who had left the room of her own accord and was now in the cable car. Sarah then quickly went to contact the professor at the observatory by phone to alert him that Anne was on her way there. In the meantime, the pilot of the search plane radioed the search party that he had spotted Brett, waving below. He reported Brett's position before departing. From what we could gather, the two searchers made their way to Brett's location but could find only his pack. It’s what they found in the pack that’s incredible - Dewhurst's severed head! They would hardly have had time to get over their shock at this sight when Brett appears to have suddenly appeared killing both men with a sharp weapon, probably a climbing pick. By now Anne had reached the observatory and was said to be sitting quietly in the lab as the professor and Wilde were conducting measurements. It seems that Anne had gradually slipped away unnoticed and as she attempted to open the entrance door our returning search party intercepted her and prevented her from leaving. 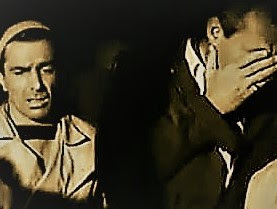 Upon our return to the Hotel Europa and after Anne went back to her bed, Brooks and Professor Crevett went on to consider the strange radioactive cloud. It was at this point that I decided to reveal to them that I was indeed a journalist who was investigating the mysterious deaths and disappearances. I also informed them that I had some knowledge about similar incidents in the Andes three years previously and that Brooks and the professor had linked such events to the presence of alien creatures. My sneaking suspicions concerning Brooks were then somewhat confirmed when he disclosed that his UN role involved him being part of a special taskforce charged with the task of investigating possible alien invasions. The atmosphere of surprise and shock was suddenly added to with the appearance of Brett who stormed in out of the blue. He appeared to be terribly drained of energy and his movements were quite uncoordinated as could be gauged from his faulting attempts at pouring himself a drink. 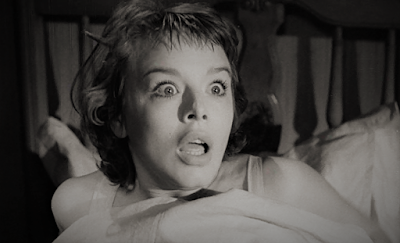 As we observed Brett, Anne had come down from her room, and as soon as Brett caught sight of her, he transformed into some kind of homicidal maniac. Before Brett could stab Anne with a knife, Brooks intervened and struck him sending him careering backward. Brett’s head struck a bronze statue of a wolf, resulting in him sustaining a deep gash on his head. To our astonishment Brett’s head wound wasn’t displaying any evidence of bleeding at all! After Brett was carried into the wine cellar and his head wound was stitched up, we left him locked up and sedated and then went on to consider informing the UN of the whole situation. Later on, it appears that Brett had awoken from his forced slumber. For some reason Mayor Klein had gone down to the cellar and Brett somehow got hold of him, killed him and released himself from the improvised cell by using the mayor's keys. According to Sarah, she was woken up by the sound of commotion going on. When she went to investigate, she spotted Brett who was in possession of a large cleaver making his way toward the stairway to the bedrooms on the upper floor. As Sarah quickly tried to alert Brooks, Brett entered the Pilgrim sisters’ bedroom. Anne then awakened to find Brett standing over her bed with the cleaver raised to strike. As she screamed, a single shot rang out killing her would-be attacker. The bullet came from the gun that Brooks was holding from where he stood in the doorway. An examination of Brett's body by Brooks and the professor revealed an unusual feature on his skin. Upon closer inspection using the illumination an oil lamp, the flesh of Brett's arm appeared to vaporize, leaving only the skeletal remains exposed. 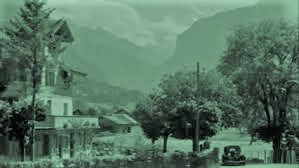 It was at this point that I rushed into the room bearing news that the observatory had information that the radioactive cloud had begun to descend the mountain and was making its way directly toward the village. The only safe place for everyone seemed to be the heavily fortified structure of the observatory. As the cloud began to move relentlessly down the mountainside towards the hotel, our group and many of the villagers headed off to the cable car. As the impromptu evacuation proceeded, from the cable car platform the refugees witnessed the shocking spectacle of the cloud pouring down from The Trollenberg into their village below. When the cable car arrived at the platform and as the helpless onlookers rushed to board the car, one of the women realized that her daughter was nowhere to be seen. It turned out that her daughter had accidentally dropped the ball she had been playing with in the hotel lobby and had gone back to retrieve it. Brooks heroically seized the initiative and ordered me to leave him behind if he couldn’t return before the cloud headed toward them. He then made his way back down toward the village and the hotel in search of the missing girl. 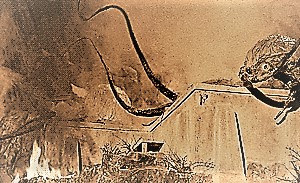 According to Brooks, when he arrived at the hotel lobby, he noticed that the doors had been broken inward from which he was confronted by an horrific sight – a monstrously massive globular creature with long lithe tapering tentacles and possessing a single huge eye. More shocking still was that this bulbous behemoth had seized the young absconder with one of its tentacles. 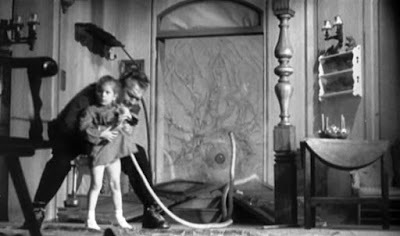 After having the life almost squeezed out of himself, Brooks managed to extricate himself, sever the tentacle holding the girl and escape with her unscathed. The return to the cable car and their ascent to the observatory was fraught with danger. The mist reached the cable car platform below and ice began to form on the cable car pulley. With the freezing of the motor, the cable car began to lurch violently. Fortunately, the cable car arrived safely at the observatory platform allowing Brooks to get the rest of the passengers out. When the steel door of the observatory opened, Brooks and I were taken to the main laboratory while the villagers gathered near the entrance. We then found out from Crevett that the cloud had split up into four and then five separate clouds, all converging on the observatory. Hans, who was spotted on the video monitor, suddenly turned up at the observatory. Once inside, he explained that he had encountered the cloud on the road and had turned back. It was noticed that he began to exhibit strange behaviour as if he were disoriented and confused, as well as complaining about it being too hot. After we left him and returned to the lab, Anne noticed that Hans was peering around the corner and looking at her in a crazed manner. Not surprisingly, Anne retreated into the professor’s office at the rear of the lab. Meanwhile, a sudden drop in temperature on the platform outside was noted. 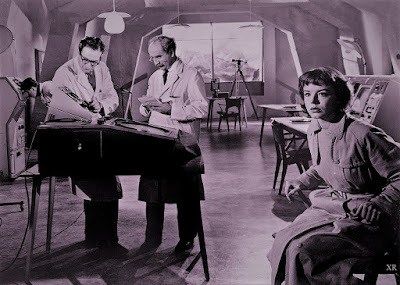 This set Brooks to thinking about the need for cold by both the alien creatures and those humans under their control. Added to that was the fact that Brett had complained of the heat in the hotel before his attempt to kill Anne, as well Hans’ complaint about the heat when he turned up at the observatory. We soon found Hans in the office in the process of strangling Anne. I managed to jump onto his back and get him off Anne. 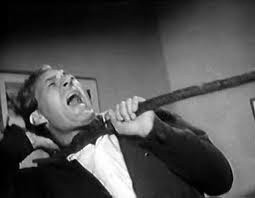 Brooks quickly entered and after struggling with Hans he was able to stab him with a letter opener causing him to collapse. As the alien creatures neared the observatory, a plan was put into action involving the making of Molotov cocktails to combat them. In the lab Brooks ordered an airstrike of firebombs to be dropped on the observatory, in the hope that its reinforced concrete roof and walls would withstand such an assault. The professor alerted Brooks to the video monitor as the aliens made their way slowly up the rocky slope toward the observatory. Brooks then grabbed one of the Molotov cocktails before venturing outside and lobbed it at one of the creatures. I then followed Brooks’ example but was unfortunately snatched upwards by one of the alien’s tentacles. As I hung there above the ground dangling from the unearthly living gallows, Brooks bravely launched a Molotov up toward the roof of the observatory. I then fell unceremoniously to the ground as the creature holding me retreated with a spine-chilling shriek and its body set ablaze. Brooks and I were then able to make it back inside from where we sealed the door. As Sarah took care of her unconscious sister in the office, one of the tentacled creatures caused the wall behind them to crack from the intense cold. Suddenly a large chunk of concrete wall fell inward revealing the creature outside. As its probing tentacles waved through the opening, searching and grasping for Sarah and Anne, Brooks burst into the room in a valiant attempt to rescue them from the alien’s clutches. As Brooks struggled to extricate himself from one of its tentacles, I moved Sarah and Anne to the main lab. I then got hold of another Molotov cocktail, returned to the scene of Brooks’ struggle with the creature and hurled the crude incendiary device at the latter thereby allowing Brooks to free himself from its grasp. After hastening back into the lab and closing the door, we learned of the approach of the fighter plane. Brooks proceeded to instruct the pilot to bomb the cloud covering the observatory. The fighter pilot with the call-sign, "Jolly Rodger" made his first pass and began dropping his fire bombs. The roof and surrounding buildings were struck. By the second pass the creatures were engulfed in flame, their immense bodies reduced to blackened and smoking husks. When it was all over, the steel window shutter opened to reveal a world filled with sunlight along with the charred remnants of evidence which would at last validate Brooks’ and the professor’s theory. As for the young lady at the centre of this event? Well, let’s just say Anne will be safe in my company! Disaster for a town averted! Earth free from alien invasion! And free of clouds for the first time in three years! Let’s hope it stays that way…. ....But let’s be realistic as well. We now know for certain we are not alone in the universe. It is equally certain that other species are fully aware of our existence and the planet of which we are custodians. For all we know they may have their own version of terra nullius which they may use to justify their eventual settlement and occupation of our planet resulting in the possible extermination of the human race. After all, we may simply be living in a universe where survival at all costs is the guiding principle that motivates all species. The presence or absence of any particular species may be of no consequence to an uncaring universe. Despite our hubris and human-centric view of existence, we perhaps just do not matter in the face of an immense, impersonal and ever-expanding universe. The fact that aliens came to Earth and established themselves in the rarefied atmosphere of a mountain; the fact that Brooks and the rest of us battled against such overwhelming odds to stay alive or that humanity persists with its efforts to push further and further out into space – all this may be part of a process in which life struggles to find a way. It therefore MATTERS to the living to stay alive and to do what it takes to stay alive. 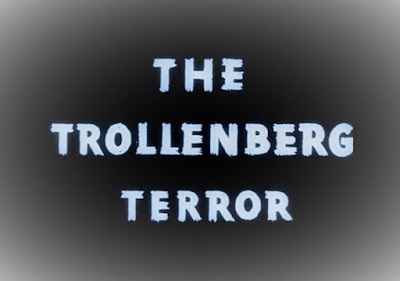 A certification from the British Board of Film Censors clearing The Trollenberg Terror for audiences of 16 years or older. 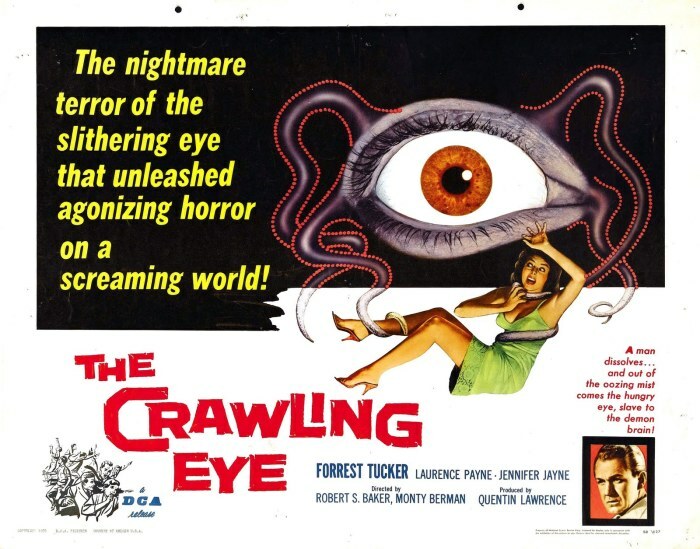 The original title of the 1958 independently made British black-and-white science fiction film is The Trollenberg Terror, while its American title was like many other films dumbed down to The Crawling Eye. In fact, for its release in the US, the film was cut down to 75 minutes from the full running length of 84 minutes, because the American distributors wanted to get to the monsters faster - Impatient bastards! 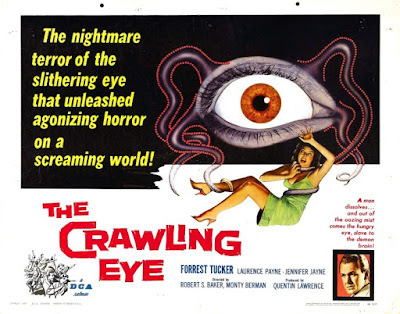 This film was first shown on a twin bill with The Strange Case of Planet X (The Cosmic Monsters), the previous film featured on this blog. 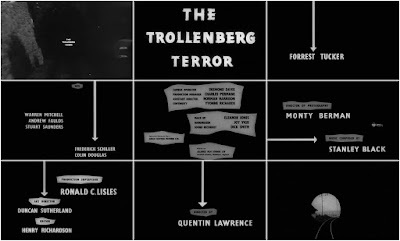 The Trollenberg Terror is based on a 1956 British ITV "Saturday Serial" television programme. 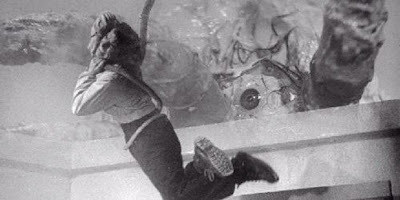 In the original production, the alien creatures were called "Ixodes” while the film's central character, Alan Brooks was not included in its cast-list. 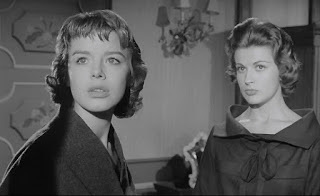 The supporting cast in the form of Janet Munro who plays young Anne Pilgrim, the vulnerable psychic damsel-in-distress and Jennifer Jayne who plays Sarah Pilgrim, the dutiful and beautiful older sister, somewhat typify the portrayal of women in films of that era. In our modern era there’s a preference or even obsessive desire to incorporate so-called strong and (that bloody word) “empowered” female characters in sci-fi and other genre films. 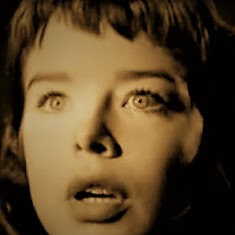 Nevertheless, in the Trollenberg Terror, we do have two independent young women supporting themselves with their psychic act and Anne’s role is indeed pivotal to the whole film. √One or more female characters in complete control and behaving exactly like men. √One or more female characters slaughtering any number of men in hand-to-hand combat. √The unedifying sight of a couple of hefty and/or sinewy and sweaty female characters all muddied up and going at each other with fists, feet and weapons. √At least a couple of female (rarely male for some reason) characters snogging each other. 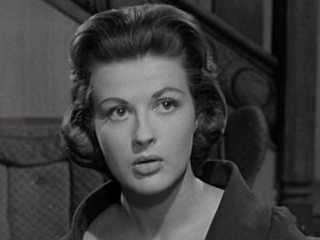 It’s as if (just as it was 60+ years ago) female character roles are dreamt up largely by male minds with their target audiences in mind – young males just waiting to be titillated! All this offered up under the phoney guise of gender inclusion and equality. For every action there’s an opposite and equally stupid re-action. As long as the cash comes rolling in! The end result of this “modern” approach supposedly reflecting society's perceived enlightened values is that we have a bunch of completely uninteresting and unbelievable female characters lacking both class and style who simply take on the same role as that formerly occupied by males. Not exactly the best of role-models either! Females deserve better than that in any era.